AL-RAWI, Abd-al-Rahman ‘Ali Husayn al-Ahmad (a.k.a. AL RAWI, Abdulrahman; a.k.a. AL-RAWI, Abd-al-Rahman; a.k.a. AL-RAWI, Abdul Rahman; a.k.a. AL-RAWI, Abu Abd Al Rahman), Turkey; DOB 1983; POB Albu Kamal, Dayr az Zawr Province, Syria; nationality Syria; Gender Male; Phone Number 905515983567; alt. Phone Number 9647718635788; alt. Phone Number 96351667406; alt. Phone Number 9647715959705 (individual) [SDGT]. AL-RAWI, Muhammad Abd-al-Qadir Mutni Assaf (a.k.a. MATNEE, Mohammed Abdulqader; a.k.a. MATNI, Muhammad ‘Abd-al-Qadir; a.k.a. MUTNI, Mohammad Abdul Kadir; a.k.a. MUTNI, Muhammad Abdul Qadar; a.k.a. “ABD-AL-QARIM, Abu”), Erbil, Iraq; DOB 15 Apr 1983; Gender Male; Passport G2590897 (individual) [SDGT]. AL-RAWI, Muhannad Mushtaq Talib Zghayir Karhout (a.k.a. TALIB, Mohanad M.; a.k.a. TALIB, Muhannad Mushtaq; a.k.a. ZUGHAYAR, Muhanad Mushtaq; a.k.a. ZUGHAYAR, Muhanad Mushtaq Talib), Baghdad, Iraq; Samsun, Turkey; DOB 26 Dec 1996; POB Al-Qa’im, Iraq; nationality Iraq; Email Address mohand.alrawii@gmail.com; Gender Male; Phone Number 9647821757598; National Foreign ID Number 00167950 (Iraq) (individual) [SDGT]. AL-RAWI, Mushtaq Talib Zughayr (a.k.a. AL-HASHIMI, Mushtaq Talib Zughayar Karhut; a.k.a. AL-RAWI, Abu Mus’ab; a.k.a. AL-RAWI, Mushtaq; a.k.a. AL-RAWI, Mushtaq Talib; a.k.a. 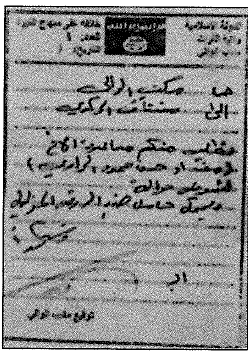 AL-RAWI, Mushtaq Talib Zaghayir), Turkey; Belgium; DOB 1964; alt. DOB 1969; Gender Male; Phone Number 905537471039 (individual) [SDGT]. AL-RAWI, Umar Talib Zughayr (a.k.a. AL-HASHIMI, Umar Talib Zughayr; a.k.a. AL-RAWI, ‘Umar Talib; a.k.a. AL-RAWI, Umar Talib Zughayr Karhoot; a.k.a. ZGHYR, ‘Umr Talib; a.k.a. “AL-RAWI, Abu Umar”), Samsun, Turkey; al-Qa’im, Anbar Province, Iraq; Mersin Province, Turkey; DOB 1970; alt. DOB 1971; POB Iraq; nationality Iraq; Gender Male; Phone Number 907816941101; alt. Phone Number 9647734097694 (individual) [SDGT]. AL-RAWI, Walid Talib Zughayr (a.k.a. AL-HASHIMI, Walid Talib Zughayr; a.k.a. AL-RAWI, Waleed Talib Zghayir Karhout; a.k.a. ZGHAIR, Waleed Talib Zghair; a.k.a. ZGHYR, Walid Talib; a.k.a. “AL-RAWI, Abu Khalid”), Baghdad, Iraq; DOB 11 Nov 1988; nationality Iraq; Email Address waleed198811@gmail.com; Gender Male; Phone Number 9647807890955; alt. Phone Number 96407707840824; alt. Phone Number 9647720364973; Passport A11071541 (individual) [SDGT]. AL-ARD AL-JADIDAH MONEY EXCHANGE COMPANY (a.k.a. AL ARDH AL JADIDA; a.k.a. AL-ARDH AL-JADEEDA EXCHANGE COMPANY; a.k.a. NEW LAND MONEY EXCHANGE COMPANY), Iraq; Hajin, Dayr az Zawr Province, Syria; Sanliurfa, Turkey; Phone Number 9647807798905; alt. Phone Number 964805611259; alt. Phone Number9647905886647 [SDGT]. IRGC GROUND FORCES (a.k.a. ISLAMIC REVOLUTION GUARDS CORPS GROUND FORCE), Tehran, Iran; Syria; Additional Sanctions Information – Subject to Secondary Sanctions [FTO] [IRGC]. IRGC NAVY (a.k.a. ISLAMIC REVOLUTION GUARDS CORPS NAVAL FORCE), Tehran, Iran; Syria; Additional Sanctions Information – Subject to Secondary Sanctions [FTO] [IRGC]. to different counter terror sanctions programs. Note that the IRGC designations have the FTO program tag, in addition to the SDGT tag. BASIJ RESISTANCE FORCE (a.k.a. BASEEJ; a.k.a. BASIJ; a.k.a. BASIJ-E MELLI; a.k.a. MOBILIZATION OF THE OPPRESSED ORGANIZATION; f.k.a. SAZMAN BASIJ MELLI; a.k.a. SAZMAN-E MOGHAVEMAT-E BASIJ; f.k.a. VAHED-E BASIJ-E MOSTAZAFEEN; f.k.a. “NATIONAL MOBILIZATION ORGANIZATION”; a.k.a. “NATIONAL RESISTANCE MOBILIZATION”; a.k.a. “RESISTANCE MOBILIZATION FORCE”), Iran; Additional Sanctions Information – Subject to Secondary Sanctions [SDGT] [IRGC] [IFSR] [IRAN-HR] (Linked To: ISLAMIC REVOLUTIONARY GUARD CORPS (IRGC)-QODS FORCE; Linked To: ISLAMIC REVOLUTIONARY GUARD CORPS). -to- BASIJ RESISTANCE FORCE (a.k.a. BASEEJ; a.k.a. BASIJ; a.k.a. BASIJ RESISTANCE FORCES; a.k.a. BASIJ-E MELLI; a.k.a. ISLAMIC REVOLUTION GUARDS CORPS RESISTANCE FORCE; a.k.a. MOBILIZATION OF THE OPPRESSED ORGANIZATION; a.k.a. NIROOYE MOGHAVEMATE BASIJ; a.k.a. NIRUYEH MOGHAVEMAT BASIJ; a.k.a. SAZEMAN-E BASIJ-E MOSTAZAFAN; f.k.a. SAZMAN BASIJ MELLI; a.k.a. SAZMAN-E MOGHAVEMAT-E BASIJ; a.k.a. VAHED-E BASIJ MOSTAZA’FEEN; f.k.a. VAHED-E BASIJ-E MOSTAZAFEEN; a.k.a. “MOBILIZATION OF THE OPPRESSED”; a.k.a. “MOBILIZATION OF THE OPPRESSED UNIT”; f.k.a. “NATIONAL MOBILIZATION ORGANIZATION”; a.k.a. “NATIONAL RESISTANCE MOBILIZATION”; a.k.a. “ORGANIZATION OF THE MOBILISATION OF THE OPPRESSED”; a.k.a. “RESISTANCE MOBILIZATION FORCE”), Tehran, Iran; Syria; Additional Sanctions Information – Subject to Secondary Sanctions [FTO] [SDGT] [IRGC] [IFSR] [IRAN-HR](Linked To: ISLAMIC REVOLUTIONARY GUARD CORPS (IRGC)-QODS FORCE; Linked To: ISLAMIC REVOLUTIONARY GUARD CORPS). ISLAMIC REVOLUTIONARY GUARD CORPS (a.k.a. AGIR; a.k.a. IRANIAN REVOLUTIONARY GUARD CORPS; a.k.a. IRG; a.k.a. IRGC; a.k.a. ISLAMIC REVOLUTIONARY CORPS; a.k.a. PASDARAN; a.k.a. PASDARAN-E ENGHELAB-E ISLAMI; a.k.a. PASDARAN-E INQILAB; a.k.a. REVOLUTIONARY GUARD; a.k.a. REVOLUTIONARY GUARDS; a.k.a. SEPAH; a.k.a. SEPAH PASDARAN; a.k.a. SEPAH-E PASDARAN-E ENQELAB-E ESLAMI; a.k.a. THE ARMY OF THE GUARDIANS OF THE ISLAMIC REVOLUTION; a.k.a. THE IRANIAN REVOLUTIONARY GUARDS), Tehran, Iran; Additional Sanctions Information – Subject to Secondary Sanctions [SDGT] [NPWMD] [IRGC] [IFSR] [IRAN-HR] [HRIT-IR]. -to- ISLAMIC REVOLUTIONARY GUARD CORPS (a.k.a. AGIR; a.k.a. ARMY OF THE GUARDIANS OF THE ISLAMIC REVOLUTION; a.k.a. IRAN’S REVOLUTIONARY GUARD CORPS; a.k.a. IRAN’S REVOLUTIONARY GUARDS; a.k.a. IRG; a.k.a. IRGC; a.k.a. ISLAMIC REVOLUTION GUARDS CORPS; a.k.a. ISLAMIC REVOLUTIONARY CORPS; a.k.a. ISLAMIC REVOLUTIONARY GUARDS; a.k.a. ISLAMIC REVOLUTIONARY GUARDS CORPS; a.k.a. PASDARAN; a.k.a. PASDARAN-E INQILAB; a.k.a. PASDARN-E ENGHELAB-E ISLAMI; a.k.a. REVOLUTIONARY GUARD; a.k.a. REVOLUTIONARY GUARDS; a.k.a. SEPAH; a.k.a. SEPAH PASDARAN; a.k.a. SEPAH-E PASDARAN ENGHELAB ISLAMI; a.k.a. SEPAH-E PASDARAN-E ENGHELAB-E ESLAMI; a.k.a. SEPAH-E PASDARAN-E ENQELAB-E ESLAMI; a.k.a. THE ARMY OF THE GUARDIANS OF THE ISLAMIC REVOLUTION; a.k.a. THE IRANIAN REVOLUTIONARY GUARDS), Tehran, Iran; Syria; Additional Sanctions Information – Subject to Secondary Sanctions; Additional Program Tags – [FTO] [SDGT] [NPWMD] [IRGC] [IFSR] [IRAN-HR] [HRIT-IR]. ISLAMIC REVOLUTIONARY GUARD CORPS (IRGC)-QODS FORCE (a.k.a. PASDARAN-E ENGHELAB-E ISLAMI (PASDARAN); a.k.a. SEPAH-E QODS (JERUSALEM FORCE)); Additional Sanctions Information – Subject to Secondary Sanctions [SDGT] [SYRIA] [IRGC] [IFSR] [IRAN-HR]. -to- ISLAMIC REVOLUTIONARY GUARD CORPS (IRGC)-QODS FORCE (a.k.a. AL QODS; a.k.a. IRGC-QF; a.k.a. IRGC-QUDS FORCE; a.k.a. ISLAMIC REVOLUTIONARY GUARD CORPS-QODS FORCE; a.k.a. JERUSALEM FORCE; a.k.a. PASDARAN-E ENGHELAB-E ISLAMI (PASDARAN); a.k.a. QODS (JERUSALEM) FORCE OF THE IRGC; a.k.a. QODS FORCE; a.k.a. QUDS FORCE; a.k.a. SEPAH-E QODS; a.k.a. SEPAH-E QODS (JERUSALEM FORCE)), Tehran, Iran; Syria; Additional Sanctions Information – Subject to Secondary Sanctions [FTO] [SDGT] [SYRIA] [IRGC] [IFSR] [IRAN-HR]. ISLAMIC REVOLUTIONARY GUARD CORPS AIR FORCE (a.k.a. IRGC AIR FORCE; a.k.a. SEPAH PASDARAN AIR FORCE), Tehran, Iran; Additional Sanctions Information – Subject to Secondary Sanctions [SDGT] [NPWMD] [IRGC] [IFSR]. -to- ISLAMIC REVOLUTIONARY GUARD CORPS AIR FORCE (a.k.a. AEROSPACE DIVISION OF IRGC; a.k.a. AEROSPACE FORCE OF THE ARMY OF THE GUARDIANS OF THE ISLAMIC REVOLUTION; a.k.a. AFAGIR; a.k.a. AIR FORCE, IRGC (PASDARAN); a.k.a. IRGC AEROSPACE FORCE; a.k.a. IRGC AIR FORCE; a.k.a. IRGCAF; a.k.a. IRGCASF; a.k.a. ISLAMIC REVOLUTION GUARDS CORPS AIR FORCE; a.k.a. ISLAMIC REVOLUTIONARY GUARDS CORPS AEROSPACE FORCE; a.k.a. ISLAMIC REVOLUTIONARY GUARDS CORPS AIR FORCE; a.k.a. SEPAH PASDARAN AIR FORCE), Tehran, Iran; Syria; Additional Sanctions Information – Subject to Secondary Sanctions [FTO] [SDGT] [NPWMD] [IRGC] [IFSR]. As of early May 2018, Mushtaq and a family member operated an ISIS hawala from Al­Ard Al-Jadidah Money Exchange Company in Samsun, Turkey. Mushtaq’s family member operated the business while Mushtaq traveled to Belgium. They also used the GOI pension system to launder funds for ISIS, and Mushtaq owns at least three QiCard businesses in al-Qa’im and Ramadi, Iraq and Samsun, Turkey. As of November 2017, Mushtaq oversaw money transfers for ISIS using a hawala network throughout Iraq and Turkey. Additionally, Coalition Forces previously detained Mushtaq in 2007, in al-Qa’im, Iraq as a suspected insurgent financier. Mushtaq is a former Captain in Saddam Hussein’s Republican Guards. As of late 2017, ISIS financial facilitator Abd-al-Rahman al-Rawi, also designated today, and his business partner and cousin, Umar, had been selected to manage financial affairs for ISIS’s so-called Wilayah al-Furat following the death of Fawaz al-Rawi. Abd-al-Rahman and Umar had been partners in a currency exchange company in al-Qa’im, Anbar Province, Iraq with Fawaz al-Rawi. Both Abd-al-Rahman and Umar had formally accepted their appointments. Umar was responsible for money transfers inside Iraq. In addition to dealing with large sums of money arriving from abroad and distributing the funds to ISIS’s Iraqi and Syrian provinces, Umar and Abd-al-Rahman also distributed Iraqi retirees’ salaries from the GOI via an electronic payment system. Umar and Abd-al-Rahman also transferred funds to Iraq to purchase vehicles for ISIS fighters and exchanged cash for ISIS coinage. As of late 2017, a Turkey-based merchant, who was one of the primary ISIS financial facilitators in Syria, maintained a business partnership with ISIS financier Abd-al-Rahman. Abd-al-Rahman was one of a few individuals who provided ISIS significant financial facilitation into and out of Syria. Abd-al-Rahman instructed ISIS fighters seeking to move large sums of money out of Syria to deposit the money with an office in Syria. Furthermore, when individuals wanted to send money from Turkey to ISIS members in Syria, the instructions involved Abd-al­Rahman’s. As of late 2017, Abd-al-Rahman and his business partner and cousin, Umar, also designated today, had been selected to manage financial affairs for ISIS’s Wilayah al-Furat following the death of Fawaz al-Rawi. As of late 2017, both Abd-al-Rahman and Umar, who had been partners in a currency exchange company in al-Qa’im, Anbar Province, Iraq, with Fawaz al-Rawi, had formally accepted their appointments. Abd-al-Rahman was responsible for external ISIS money transfer originating from and destined to foreign countries.